*Inexplicable, stunned disbelief* 3rd milestone blown!!! I am not exaggerating when I’m saying that this was only something I have dreamed about; fantasized in some moments about such a goal – and then discarded the notion. I did not dare to dream that so many of you fine folks would support me. I am exceedingly stunned and motivated to continue to bring you the quality reviews you deserve! You and your support, even if it is just spreading the word, means the world to me. Thank you, from the bottom of my now significantly less cynical heart! I also wanted to thank you for talking to me, spreading the word, for being awesome and I look forward and enjoy taking your suggestions and listen to what YOU want to see reviewed! As an aside: Tomorrow is a holiday in Germany and I’ll be spending the day, for once, not in front of the screen and instead go out – live, for the first time in months, actually without a gnawing existential anxiety at the back of my head – all thanks to YOU! You probably can’t fathom how much that is worth to me! Regularly scheduled reviews will resume next Monday! This pdf clocks in at 32 pages, 1 page front cover, 1 page editorial, 1 page SRD, leaving us with 33 pages of content, so let’s take a look, shall we? So, this is another pdf that puts dragons in the hands of players. My dislike for this very concept is by now probably widely known, so rest assured that I am not a fan of the very concept this book is based. My first thought here was simply that I did not want to do the vast amounts of math – but hey, I guess I’m pretty much a pro regarding reviews, so I swallowed my own inclinations like a man and opened the pdf. On the first page, the pdf immediately alleviated my very first concern – overlap. Rogue Genius Games has provided the Dragonrider and Dracomancer base classes, Rite Publishing the option to play a dragon as a player-race with In the Company of Dragons – all of which are excellent products ad this pdf acknowledges this and does NOT try to wilder in their areas of expertise – plus, pointing them out to potential customers is a great example of 3pp-camraderie. A quick glance at the pdf’s pages does show that the dragon race as used herein clocks in at 33 RP – and even though the RP-value from the ARG is anything but reliable, more than thrice the RP of humans should drive home the notion that yes, even small dragons are powerful and as presented herein, only should be used as PCs in the most high-powered of games. So what, if not that, does this pdf cover? Well, dragon companions. Dragons as cohorts (including synergy with the glorious leadership handbook.). Dragons receive the following racial traits: +2 Str and Cha, 30 ft. speed, 30 ft. fly speed (average), start off as small, get darkvision and low-light vision, +2 natural armor and a bite and 2 claw attacks at 1d4 and 1d3, respectively. As a nitpick, I would have liked them to specify whether these are primary or secondary natural weapons – and yes, I am aware of the default-rulings here, but not having to look it up is always better than searching for the info. Breath weapons are either 60-ft. lines or 30 ft. cones and have a save DC of 10 + level + con-mod. Per default, the breath weapon can be used 1/day. Now why would dragons accompany those puny, squishy, scale-less murder hobos? Simple: Power-gain. The rationale is genius: Dragons doze all the time, slowly gaining power. The issue is that young dragons will have a hard to impossible time to defeat older dragons – so some opt to become “sleepless.” These dragons may scorn the traditions of their ancestors (thus coming with built-in reasons for dragons to try to take the PCs and their cohorts out…) and thus accompany e.g. PCs for power and protection. Dragons, as detailed here, are organized in septs, something chosen at 1st level. Each sept modifies the racial traits – from subtypes to movement rate modification to the breath weapon and the additional qualities, these septs provide surprisingly well-balanced ability-modifications – Brass dragon septs get, for example fire immunity…but also cold vulnerability. And yes, I could break them down, sept by sept – but know what? That would bloat this review beyond compare. Why? Because they ALL are covered. Chromatics and metallics are obviously covered – but so are brine and cloud dragons, lunar dragons, magma dragons, time dragons, vortex dragons – honestly, I had forgotten about the existence of some of the more esoteric among these. Beyond these, favored class options, including the ACG-classes, the Occultist, the superb technician (from Age of Electrotech) and e.g. the mystic from Amora’s Liber Influxus Communis yes, an age, height and weight-table. There also is a dragon racial paragon-class – which receives d12, 6+Int skills per level, no proficiencies beyond natural weapons (but do not take arcane spell failure when wearing light armor once you become proficient in it), all good saves, good BAB-progression, spontaneous sorc/wiz-spells via Cha of up to 4th level, natural armor +1 at 4th level, +1 at 9th, 13th and 18th level and, of course, attribute and size modifications throughout the levels obtained. Draconic powers not gained via the chosen sept are instead gained via the draconic heritage class feature at 1st, 3rd and every 6 levels thereafter. Frightful presence is its separate entity and need not be chosen. At 2nd level and every 3 levels thereafter, the draconic paragon also receives a bonus-feat, one to be chosen from those with the [dragon]-descriptor. Finally, the class receives scaling DR, blindsense etc. It should be noted that the heritages themselves can be approximately likened to bloodlines, orders etc. in that they offer bonus spells, modifications of abilities and linear ability-progressions over the levels – as well as a unique capstone for each heritage, often in the guise of very powerful SPs. And yes, unique effects can be found herein – the red dragon paragon for example, learns to melt stone at 15th level – with different effects when e.g. targeting the floor or the ceiling, potentially grounding e.g. flyers hit by the lava. And yes, the complex wordings such abilities require are delivered with the trademark, almost Zen ease I have come to enjoy from Alexander Augunas’ writing. Want to know what’s even cooler? These heritages double as bloodlines for the purposes of qualifying for certain abilities, PRCs, feats, etc. – but only, obviously, for the draconic bloodline. As a drawback, a heritage locks you out of certain options – like non-dragon bloodlines. So this massive section covers the cohort option – but this is, after all, the COMPANION handbook – and as such, the handbook also provides a companion-like treatment – with level-based advancement stats for every one of the huge amount of dragons provided, including, of course, the massive 20-level table for your convenience’s sake. Now a handy table explaining subtypes is nice – a table that handles aging and even age regression and the effects on dragons? That is one-step-beyond level of care. Now I have already talked about there being a significant array of (dragon)-feats to modify your draconic companion. Speaking of which – how do you get one? Easy, via a concisely defined feat that acts as a tax for the obviously superior power of a dragon companion over a non-dragon companion – and before you ask: Yes, the feat has a rank-based limit that prevents a character from achieving easy dragon-based flight at 1st level – as mentioned in the beginning, there are classes for that and sticking to its guns is pretty smart for the book, as it allows for a proper balancing that e.g. dragonrider etc. achieve via other means. Now, if you are playing e.g. a kobold or a dragon sans the paragon class and still want to benefit from a heritage, that s covered as well. Faster movement rates, breath weapons, camouflage – the feats are numerous and provide ample of choices. Wanna go dragons…in SPACE? There’s a feat for that. Petrifying foes dropped to 0 hp? Superb ambush predator tricks? Yup, all there. editing and formatting are top-notch, I noticed no significant glitches apart from e.g. a Special-line not bolded and similar cosmetic hiccups – those are few and far in-between, though. Layout adheres to a beautiful two-column full-color standard and the pdf comes fully bookmarked for your convenience. The original pieces of art by Jacob Blackmon are beautiful, with especially the dragonrider battling cthulhoid creatures IN SPACE being fantastic. Alexander Augunas’ Dragon Companion Handbook is one of those pdfs I dread – so much math, so many numbers. Making such a book must have been capital “W” work – and yet, this book breathes a very fresh and light spirit – surprisingly, this book feels very much easy to use, easy to grasp and balanced in an almost uncanny way. The companions herein work, mainly because they do not claim to be anything else – The dragonrider and dracomancer balanced the dragon via action economy; In the company of dragons did so via essentially radically redesigning the whole concept. Both succeeded in interesting ways. 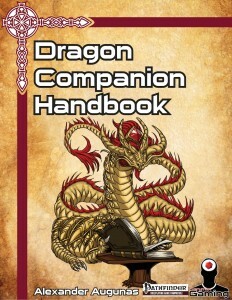 The Dragon Companion Handbook also succeeds in this endeavor by focusing on its design-goal. And yes, the book goes a step beyond and theoretically does allow for the full-blown super-high-power gameplay of these as characters, if that’s the campaign you are going for; heck, even for low-level games, the linear codification of draconic abilities may allow for a finer grained way of balancing draconic adversaries to make them viable adversaries when vanilla bestiary dragons would be too much; one could conceivably even use the rules herein to create dragon/class/race-hybrids for adversaries. Let me state that flat-out – I can’t find fault with this book. For me, as a person, this book is 4 stars due to the reason that I just can’t get myself to like the very concept this book caters to – dragons, to me, are the big, bad movers and shakers, not the adventuring pets, no matter how good or organic the rationale may be. As a reviewer, though, I have to admit the elegance of the design herein, the smooth flow of…everything and of course, the fact that this book triumphantly succeeds at what it sets out to do, including taking the intangible, non-math benefits into account, which I elaborated upon in “In the Company of Dragons”‘s review. Which brings me to the point – the synergy is the final, shining star here, the last viable means of complaint I could have offered – and it is eliminated on the very first page. As a reviewer, I have to rate this 5 stars -and even if you’re like me and loathe the concept, the scavenging of mechanics still renders this an excellent purchase, well-worth of your hard-earned bucks. 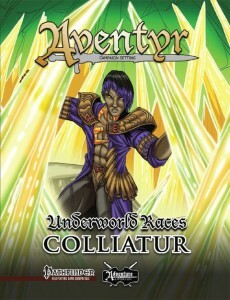 You can get this great book here on OBS and here on d20pfsrd.com’s shop! This pdf clocks in at 6 pages, 1 page front cover, 1 page editorial, 2 pages of SRD, leaving us with 2 pages of content, so let’s take a look! What series would hence be better suited as the first product I’ve reviewed by Flaming Crab Games? So, what do we receive? Well, we obviously receive an encounter – but its set-up goes slightly beyond what one would expect: 3 different set-ups for the encounter are provided: From a cunning trap engineered by the wolf to stumbling upon the wolf’s doing, the set-ups can be considered well-crafted and diverse/detailed enough, as far as hooks go. Speaking of which – the solid statblock for the Big Bad Wolf, here envisioned as a CR 6 unique outsider (including, thankfully, swallow whole et al.) 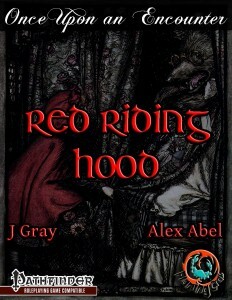 and the one provided for Red Riding Hood can be considered surprisingly fresh – the latter has been reimagined as a paladin…alas, as a conflicted one, for the lady suffers from the taint of the wolf, which makes her temper volatile and might cost her paladinhood, should she not manage to slay the dread beast. As such, the characters offer a dynamic I did not expect from the encounter set-up, so kudos for that! Red’s riding hood has been introduced as a shoulder-slot occupying item that helps the wearer to discern falsehoods and see through illusions, while also providing 1/day true seeing. Beyond that, there are two boxes with scaling DCs that should net some information for PCs actually doing proper legwork when tackling the challenge herein – a box for Red and the Wolf detail that. So, let’s get this out of the way – set-up-wise, this is a damn cool encounter and the builds for both Red and Wolf are nice. Alas, one can also perceive the distinct note of this being a first installment in the series in the finer details and the rough edges one can find with a fine-tooth comb. One example would be, alas, found in one of the cooler options herein – namely skinning the Big Bad Wolf to wear his pelt: While the survival DC to skin him is provided, the effect being specified as like that of a hat of disguise, the piece lacks the CL of the alter self effect. While just taking the default stats of the hat certainly is possible, it does detract from the coolness of the pelt. A higher CL and proper information on what slot the pelt occupies would certainly have been appreciated. The stomach can be salvaged as a bag of holding type II, but again no CL of unique effect is provided. I also like how the teeth can be used as power components, but they can also be used to cast transmutation spells at +1 CL – which is cool, but do they act as a focus or material component when used in conjunction with spells? I *love* the “unique monster-bit-scavenging” – in fact, I require the like for crafting in my homegame. However, at the same time, I would have loved this set-up to go slightly further and provide more unique benefits. On the nitpicky part, one survival check for skinning, stomach and teeth feels a bit much – separate DCs for the items would have made more sense to me, but that is me being nitpicky. A second rough edge, imho, would be Red’s cool, volatile temper – “Any time Red Hood perceives another’s words as insulting to herself, her honor or her goddess, she must make a DC 10 Will save or attack the speaker.” While the pdf tells the DM to potentially raise/lower the DC, Red has a will-save of +8, meaning that chances are pretty slim for her to fail the save – depending on the DM’s interpretation of “insulting to honor or goddess” she arguably might never blow up. Since the encounter already mentions that the taint’s influence grows, why not add a timer and have the DC rise per day, with outbursts resetting the timer? In my book, that would have made the threat more dynamic and organic and provide DMs with a better base than their own fiat/bad luck. Finally, there is one detracting component I need to mention – if you are looking for an interesting terrain set-up, some options to use weather, thickets etc. to render the encounter more complex, you won’t find those here. Editing and formatting are very good, there is not much to complain about in this department. Layout adheres to a relatively printer-friendly two-column standard with thematically-fitting stock-art. The pdf has no bookmarks, but needs none at this length. Alex Abel and J. Gray deliver an encounter that turned out to be more inspired than I would have imagined. In fact, both the builds and the micro-story embedded in this encounter work quite well. Indeed, I love the monster-scavenging, the troubled paladin-take on Red etc. – this is a pretty nice offering indeed. Alas, it also suffers from some minor rough edges and falls short of its own potential – with some terrain modifications, slightly more defined and unique scavenging etc., this could have reached the highest echelons. As written, we receive a solid encounter with nice statblocks for just a buck. My final verdict, hence, will clock in at 3.5 stars, rounded up due to the low price and due to being the first in the series. I’m looking forward to see how the product-line matures! You can get this interesting encounter for just a buck here on OBS and here on d20pfsrd.com’s shop! …no, I’m not gonna insult your intelligence by summing up a premise that can be read in the title of this pdf as a rhetorical question. I loathe how shields work in PFRPG. Their bonuses are paltry and often, the benefits cannot stand up to similar benefits granted by more massive weapons and over all, shields always felt to me like they did not do their job: We all know the iconic images of characters covering between shields to weather dragon’s breath or fireballs flung at them. why then do shields not simply grant cover? A heavy shield, to give you an example, nets partial cover (+2 AC, +1 Ref) when used regularly, standard cover (+4 AC, +2 Ref) when fighting defensively and improved cover (+8 AC, +4 Ref) when using the total defense action. The distinct reader may note that no, abuse of this cover for Stealth-purposes is NOT possible. Interaction with Shield Focus and similar tricks are covered as well, as are tower shield’s special tricks and the interaction with these rules. Even a kind of stacking of cover when employing shields while adjacent to a wall is covered. Editing and formatting are good – though I noticed a plural/singular discrepancy, I don’t consider this important. Layout adheres to a beautiful, easy to read 2-column full-color standard ad the pdf has no bookmarks, but needs none at this length. So yes, I do like this system – mainly due to it rewarding basic tactical decisions and since it provides a more strategic array of options when using shields, options which feel more diverse and closer to what shields in my opinion should do. This little pdf is in fact pretty close to a houserule I used in some of my campaigns. What is here, is functional and nice, but the premise does suffer from the brevity of the format – While e.g. the interaction with Lob Shot works still (and pretty much feels organic to me), Improved Precise Shot is still the bane of cover and unique benefits for tower shields that make these cumbersome things more versatile would have also been nice – as written, they are treated as just another shield class. Author Lucus Palosaari delivers essentially a nice, inexpensive and pretty concise house-rule that should not break any game and offer some easy tactical depth and increased reason to opt for sword-and-board fighting styles. While not perfect, this pdf can be considered an inexpensive rules-variation. It could be more complex, but honestly should be a great fit for quite a few groups out there. Oh, and one can easily expand the content herein, making the system more complex – which is exactly what I intend to do. 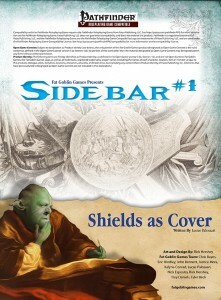 All in all, this pdf thus remains, at least for me, a solid 4 stars – this may not be earthshattering, but it is a nice option for people dissatisfied with how shields work in vanilla PFRPG. You can get this inexpensive alternate rule-supplement here on OBS! This expansion for LPJr Design’s neat Machinesmith-class clocks in at 14 pages, 2 pages advertisement, 1 page editorial/SRD, leaving us with 11 pages of content, so let’s take a look, shall we? We begin with a new greatwork, the constructor – this greatwork occupies the head-slot and can be used to create items instantaneously from thin air. And yes, if you’ve been following my reviews, you’ll realize that the very concept is a hornet’s nest – weight-limits, masterwork items, material restrictions, etc. – there is a lot to take into account. Now here’s the cincher – the items are fleeting and come with material and weight-restrictions that, believe it or not, prevent abuse. The necessity to know what you want to make prevents the manifestation of fitting keys from thin air (unless the DM is lenient) and the restrictions even manage to maintain the balancing scarcity/price-level of firearms, clockworks etc. – Which renders the greatwork’s basic capabilities one impressive feat of design. Kudos! Now where a basic nod from me becomes a full-blown grin would be with the progression of the upgrades of the greatwork – here, steel and yes, even progressive magic item creation on a temporary basis become possible. If you even remotely think about the very notion, you’ll realize the sheer amount of issues this necessarily creates – and will realize what an impressive feat the avoidance of just all of these problems is. The rules presented are so concise, they even take destructible items à la staves of the magi into account – oh, and the upgrades come at times, when the creation of firearms etc. from thin air become more than valid and not unbalancing. The permanent item creation at capstone levels, feat-interaction – this greatwork is a mechanical beauty and should be considered the reference work for crunch like this. Yes, charges etc. are covered. I can’t stress enough how much I enjoyed this greatwork and want to stress that yes, this makes non-magic crazy-prepared characters very much within the realm of possibility. We also receive new machinesmith tricks – analyzers allow for the rerolls of natural 1s, faster motion analysis and a pretty cool idea: Scanning spells from scrolls to cast them on the fly via the analyzer – once again a hornet’s nest of design to cover that manages to get expensive components, etc. – all RIGHT! Mechanus augmentations have a different formatting for their header than the other tricks. The tricks here include additional charges, storing and launching drones from the mechanus, adding poison-biting capacity and even providing a rudimentary intelligence – yes, complete with a limited skill- and feat-list. Moebius suits can have crossbows/firearms installed, can provide monk-style improved unarmored strikes and higher level suit-wearers may even dimension door or spell turn. If you have a moebius weapon, a crit-stunning impact hammer, additional, charge-costing attacks and progressive replacement of str/dex with into for attacks/damage (with multiple taking of the trick providing progressively better replacements) as well as bleed damage and maneuver-enhancers provide for neat tricks. The aforementioned new constructor can create more items, recall them or produce on greater scales – and at high levels , execute mage’s disjunction. The augmentations provided for the converter include environmental attunement, short-range fire-novas and high-level time stops. Of course, we also receive an array of new gadgets – from alchemical sprayer (including improvements and concise mechanics), crank-powered third arms these are just as awesome – and I’m saying that before the more unique options, like deploying melee-turret-style fighting bots, instant-minimoat-creating brass worms, folding horses, flamethrowers, pneumatic launchers and portable cannons enter the fray. What about circular saws? One-man rampage armors? Dune-style water-purification devices? Sound-based stunners? Yeah. Awesome! The techniques provided include losing prepared prototypes for greater dispel magic or even share their tricks – the techniques herein may be less flashy than the aforementioned options, but they nevertheless are powerful, nifty options. Finally, we also receive numerous new prototypes, some of which utilize the new and concisely-defined construct-subschool – here, we get animated swordsmen and shieldbearers, concussive bombs, emergency stabilizing constructs, electroshock coils for weapons, explosive tips for ammunition, prototypes tailor-made to blow locks apart and even vibro-blade enhancements. Editing and formatting are good, but the one component I could complain about – the formatting of the titles and subtitles is not consistent. Layout adheres to LPJr Design’s beautiful 2-column full-color standard and the pdf comes with gorgeous full-color art – all original and as beautiful as you’d expect. The pdf’s printer-friendly second version is also in full-color – and less than 1 mb! I thought at first something went wrong with my download, but no – fully functional. The pdf comes fully bookmarked for your convenience. This pdf can be summed up in “Stepping up your game.” After the evocative, but rushed and flawed first two machinesmith expansions, I was not looking forward to this one – and oh boy was I wrong! LPJr Design’s high-concept books have a surprisingly pervasive way of sneaking into my games, even when I complained to no end regarding a flawed piece of crunch or another – there is usually this sense of pure joy, of high-concept awesomeness in the books. Know what? This one marries this unmitigated joy with crunch mastery of some of the most difficult-to-execute, complex systems for one simply inspired expansion. I am not kidding when I’m saying that this utterly blew me away and that it should be considered a must-own pdf for any user of the machinesmith. Even if you don’t use the class, any steampunk/magepunk/whatever-system can benefit from the wealth of riches and precisely-executed crunch. Unless I’m sorely mistaken, this was the first such pdf by Jonathan Palmer I’ve read (I know him mainly from some Headless Hydra supplements, magic item supplements and the basic machinesmith) – and I definitely want more – Sir, my hat’s off to you for this glorious expansion. Same goes for LPJr Design – this level of quality definitely deserves accolades! My final verdict will clock in at 5 stars + seal of approval – and yes, I am very glad I am able to dish out this verdict – the machinesmith deserves tools of this quality. You can get this awesome Machinesmith-expansion here on OBS! We begin this supplement with vistas both unique and wondrous – in the towns of the dwaves, one may witness a plethora of sights and sounds mundane and wondrous – from chimney stacks that bear witness to the industrious nature of the stout folk to dwarves strumming the lyres (there is in fact a correlation between music and productivity), the life of a busy settlement breathes from the massive 100-entry strong table – and yes, of course miners, cave-ins, smiths and the like can be met as well. Few things will endear the PCs more to the populace than quenching a dwarf’s beard, recently set ablaze or participating in competitions of boulder-throwing – a thoroughly alive place indeed. The 50 businesses also reflect the industrious nature of the dwarven people – from the obligatory smithies and architects, one can surely learn wondrous feats of engineering, while here, even second-hand equipment adheres to the high quality-standards set by the dwarven folk. Boneminders and etchers offer their services to the discerning clientele and for those PCs looking for something more out of the ordinary – what about ships to travel on lava? This single entry had me come up with essentially a whole culture, a vast set of adventure ideas – “inspired” is indeed the word to use. Whereas the primary inhabitants of such a town obviously belong to the stout race, from jailed half-orcs (rightfully or due to racial prejudice?) to halfling couriers to half-elven lawyers and pyromaniac elven exiles, the list of 50 notable folk can be described as adhering to the same level of liveliness and diversity one would expect from such a supplement – and yes, fret not -the majority of the entries does cover dwarves! Finally, 20 hooks provide for ample adventuring material – from dwarven miners lost in the tunnels to dangerous, tunneling worms that destabilize areas to gas explosions and goblin spies, quite an array of diverse options await. Josh Vogt’s Urban Dressing pdf have become a continuous source of joy for my table – the amount of life oozing from them, their unfettered creativity and their quite frankly astounding diversity has taken the weakest of the Dressing-series and brought it to a level that can only be considered inspired in all the right ways. Now racial settlements tend to be a difficult topic, mainly because you have to cater to a race’s iconic stereotypes, while still providing a distinct sense of identity. This manages to do just that – in a glorious fashion indeed. My final verdict will hence clock in at 5 stars + seal of approval. 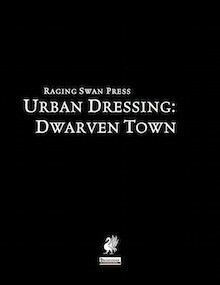 You can get this great Urban Dressing here on OBS and here on d20pfsrd.com’s shop! If you’re a huge fan of Raging Swan Press, you can also join their patreon here! This pdf of the Warrior Prestige Archetype-series clocks in at 8 pages, 1 page front cover, 1 page editorial/introduction (explaining the base concept of the series), 1 page SRD, leaving us with 5 pages of content, so let’s take a look! The Living Monolith receives d12, full BAB-progression, 2+Int skills per level and good fort- and will-saves as well as proficiency with light armor, simple and martial weapons and shields, but not tower shields. Okay, so what do these guys get? Well, for once, we receive DR 1/ and a 10% chance to ignore critical hits and sneak attacks at first level, scaling up by +1/+10% at 4th level and every 4 levels thereafter. Which is solid, seeing how in my experience DR tends to be an overvalued commodity. The living monolith also has a finely-carved scarab embedded in his forehead – said scarab not only provides a passive bonus to a bunch of saves, but also can be utilized to enlarge person the monolith. This carries a kind of issue – for once the ability is supernatural, not spell-like – which I do not object to – playtest did show that the bad armor-situation does mitigate somewhat the range received. That being said, I do have an issue with the lack of a CL – seeing how enlarge person’s duration is dependent on that and with SUs providing no default, we have a rules-gap here that ought to be closed – unlimited duration size-increase would be a rather hard pill to swallow, especially considering the lack of options to dispel it. At higher levels, enlarge person is replaced by righteous might, but alas, the problem persists. Automatic stabilization at 2nd level is nice and at 3rd level, when the lack of armor would start becoming a huge problem, the massive +8 armor bonus granted by ongoing petrification steps right in. Stability and deathwatch/detect evil as well as meld into stone at will are solid and 8th level is okay for disease immunity. Higher-level abilities include planar ally sphinx-calls, tremorsense and talking to the stones once per day – alas, again sans CL. Why not simply go SP, like the high-level statue ability that allows the monolith to weather the ages? The highest levels allow for the questioning of both the living and the dead, while the capstone renders them immortal. The pdf comes with favored class options for the core races and the anpur-race (all solid – especially the human one, which grants limited rogue talents, is VERY interesting!) 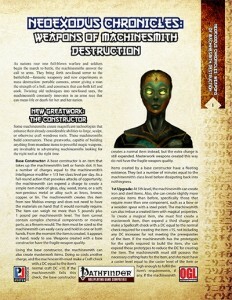 and the pdf comes with sample NPC builds at 1st, 5th, 10th and 15th level. Alas, the sample NPCs use the wrong HD – that ought to be d12, not d10. It’s not hard to adjust the bonus HP, though. Beyond these, we get a slightly retooled shatterspike and stats for various pieces of mundane equipment – nice bonus! Editing and formatting are very good, I noticed no glitches. Layout adheres to Purple Duck Games’ printer-friendly two-column standard and the pdf comes fully bookmarked and sans art apart from the cover. Carl Cramér’s Living Monolith is EXACTLY what I’d like him to do in the series – take risks, expand the concepts of the PrCs, expand their focus and rewire them in an awesome way. The Living Monolith is, hands down, my favorite WPA in the series so far – it is inspired, fun and has a bunch of abilities that could be really nasty, all finetuned with relatively subtle balancing mechanisms. I really like both fluff and execution of the class and it is, hands down, the most inspired in the series so far. That being said, the CL-glitch is annoying indeed and, unless the DM makes a ruling for a limited duration, could be rather unbalanced. It is not a serious glitch, mind you, and any DM with a modicum of experience can make that call, but still – it constitutes a significant, game-impacting oversight. It also is the only reason I can’t rate this 5 stars + seal of approval. I really, really like the living monolith and I sincerely hope that Carl Cramér continues on this design-path, enhancing lame base PrCs with unique, cool options. As provided, for now, my final verdict will clock in at 4 stars! 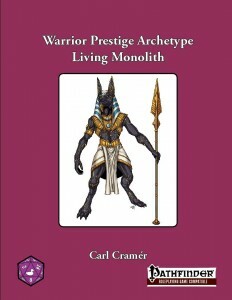 You can get this nice Warrior Prestige Archetype here on OBS and here on d20pfsrd.com’s shop! Last Hours of Westbound KS! The Westbound KS, brought to you by the Pure Steam-crew, is nearing its final hours – 7 hours to go as we speak and it has just funded! If the concept of Steampunk Wildwest tickles your fancy, check it out here! 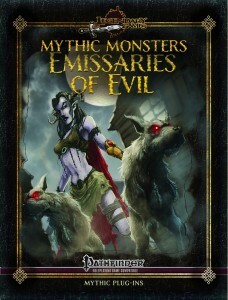 As always, we kick off this installment of the Mythic Monsters-series with a supplemental piece of content – which this time around turns out to be nothing less than an awesome, disturbing piece of prose – really liked this flavorful introduction! After getting thus in the mood for all kinds of nastiness, we dive in head first with the CR 6/MR 2 Achaierai – flinging bites and nigh impenetrable legs enhance this creature in just the right way – so we’re off to a good start. And it does not become worse – or it does, at least from a PC’s point of view. The Ankou (CR 17/MR 7) now is a true force to be reckoned with – in the careful hands of a sadistic DM like yours truly these guys can be rendered nigh-unkillable, thanks to the awesome new shadow double-related trickery they can pull off. The build also utilizes two mythic variants of feats provided for your perusal. Indeed, that is a tendency, for the next creature, the CR 13/MR 5 Dorvae also utilizes such a feat. With an aura of psychic poison and grappling/poison-bite synergy, these beings receive an appropriate lethality upgrade over their non-mythic brethren. One of my favorite creatures ever, the CR 8/MR 3 hellcat not only receives deadly telepathy to coordinate attacks, they also get a menacing purr – and yes, the imagery is glorious: What is worse than an invisible extraplanar predator seeking to tear you asunder? A group of them, always present and coordinating the attacks launched on the unsuspecting mortal fools…and always, there’s this purring. There’s a classic gothic novel/horror adventure just begging to be constructed around this creature. At the same CR/MR, the Urdefhan with their suicide blasts and lethal swords can also be considered a well-made upgrade of the basic creature. The lowest end of the spectrum, CR and MR-wise, is provided for by the Vargouille at CR 3/MR 1 – which may now execute kisses via mythic power at range – nice idea and a kiss you definitely don’t want to catch! Another, even better example for great low level mythic monster upgrades would be the Soulshriver at the same rating – these guys can attack reflections to cause cha-damage, mirror hop, etc. – and a perfect candidate to show some overly cocky adventurers who’s the boss. A classic example of a creature, which now, even more so than before, can drive whole plots and cut down foes beyond its usual CR when played smart. Superb one! At CR 15/MR 6, the mythic version of the shining child provides a nice example of a mythic upgrade that can be considered a numerical escalation, an increase in power and flexibility, but at the same time, I felt as though the awesome concept of the base-creature could have provided for some more disturbing abilities than those provided – yes, using mythic power for massive bonus damage is nice and all…but still. Then again, that may just be the fan of the creature speaking. The original creature of this installment could have been taken, at least from the neat one-page artwork, right from the Fatal Frame/Project Zero-games. The CR 6/MR 2 Maldonado is the discorporate remnant of a fallen angel, forever depending on the bodies of mortals, whose faces it may change. And it IS deadly – I’ve never seen a build so consequently focused on possessing beings – from being able to perform the deed via multiple abilities, sans touch and with various action-types, these guys will be pretty hard to keep out…oh, and yes, it can force rerolls. It can also potentially bypass protection from evil and similar tricks. And its compelling, cool write-up and prose make what otherwise would be another possessing incorporeal creature a) distinct and b) awesome beyond the narrow mechanic focus on being the master-possessor. Editing and formatting are very good, I noticed no significant glitches. Layout adheres to Legendary Games’ nice two-column full color standard and the artworks by Mike Lowe are beautiful and very distinct, breathing a sense of appropriate history. The pdf comes fully bookmarked with unobtrusive bookmarks. This installment is the work of more than the core-team for the series, a quick glimpse at the author-line among the credits-lists reads like this: Jason Nelson, Alistair Rigg, Tom Philips, Mike Welham, Todd Stewart and Sean K. Reynolds. If you’re halfway familiar with designers, you won’t wonder anymore why this installment of the Mythic Monsters-series is literally all-killer, no filler. Even creatures I personally loathe in their original iterations have received a couple of cool tricks that set them distinctly apart from their mundane, lamer brethren. My special applause, though, is reserved for night hag and soul shriver – these two are so inspired, so infinitely cooler, I absolutely adore them – they are the stand-out beasts in an excellent installment that truly deserves the moniker “Legendary” – 5 stars + seal of approval. You can get this stand-out supplement, even in this great product-line, here on OBS and here on d20pfsrd.com’s shop!